I built the OBL-15’s about a year and a half ago and have had plenty of time to get familiar with them. They replaced my OBL-11’s and were a big improvement. First, I like the JA8008 HMQ/T35 much better than the JA8008/TW034 combination. Second, I built the front baffle on the OBL-15’s from 1.5’’ thick top quality baltic birch. That was also a significant improvement over the 1’’ MDF on the OBL-11’s. Third, it's definitely worth investing in good quality caps here. I used Superior Z-Caps for the mid range and Alumen Z-Cap (excellent cap) for the tweeter. I also used Cross-Caps instead of the Premium ELKO the kit came with but did not bother comparing for sonic differences on those (did not expect to hear a big difference). 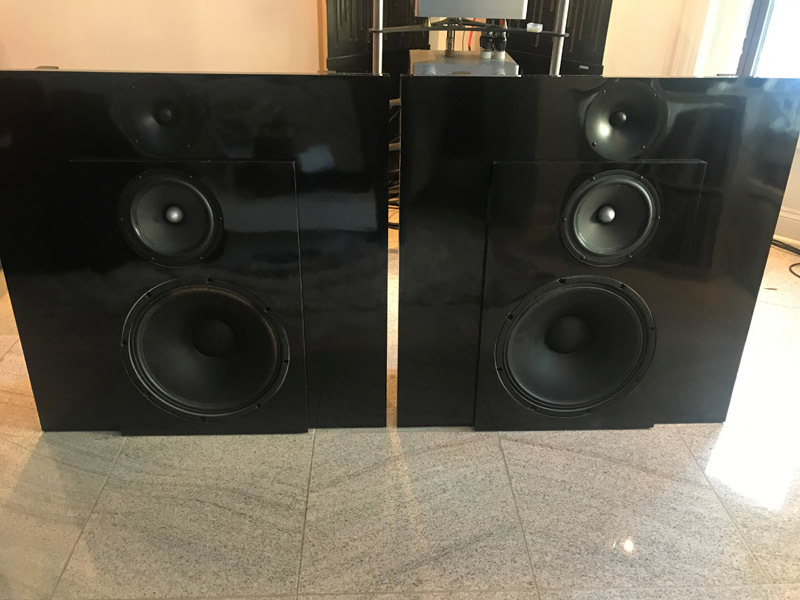 Next thing on my list to mention in this post surprised me as well… I bought the 15’’ Ciare woofers, which were really hard to find at the time as Ciare stopped production when they got acquired. But I also had the Eminence DeltaLite II 2515 from my OBL-11’s. Since both of them were able to fit without additional routing, I decided to try them as well. I liked the Eminence better than the Ciare. Not sure why, it could be related to the acoustic in my room, or the Eminence could be a little louder, but I ended up keeping the Eminence. The last thing to say was that the speakers sounded better to me in my room without the 5-degree tilting. I built them with the default tilting but ended up using a piece of cork to lift them back up. I wanted the speakers to have a modern look, so I tried using laminate (formica / wilsonart). It worked out pretty good, although it is super difficult to take good pictures of the glossy black finish. The built was pretty straightforward. 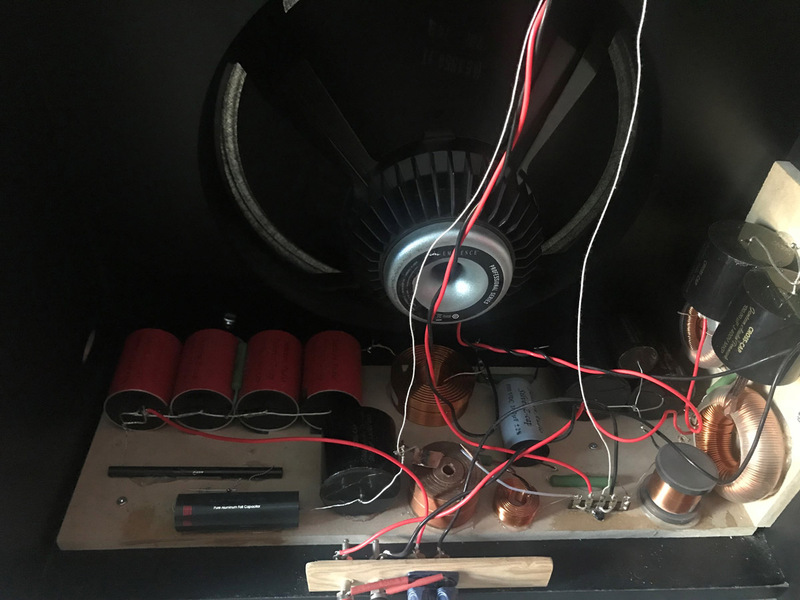 Having done the OBL-11s before (and a couple other speaker builds), there were no surprises. Probably everybody reading these comments cares the most about the sound. Well, everything said about these speakers is true. They are very dynamic and bass is amazing. Make sure you use as thick front baffle as you can (also make sure you keep the tweeter 20-22mm behind the 8008 driver) and you will get that amazing open baffle bass. It’s different than the bass you get from a closed enclosure. You will have to hear for yourself and decide if you like it. I do. My listening room is an acoustic nightmare for any speaker. Brick walls all around, granite tiles on the floor, high ceilings, and an unusual shape with a lot of corners. I had to put the speakers 5 feet away from the front wall and had to use some bass traps on the rear wall (the wall behind me). Moving these speakers even 1 inch from where they are makes a big difference. 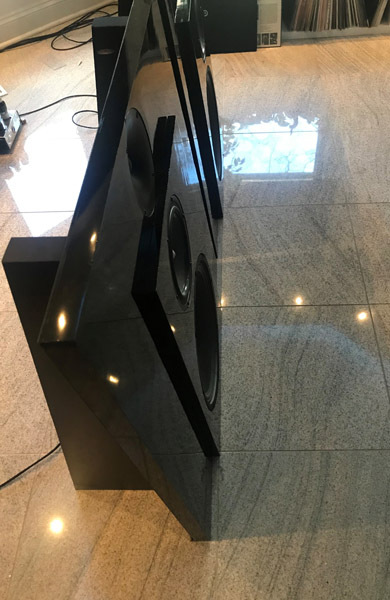 I believe this is a side effect of my living room but be prepared to play around with positioning if you are planning to build these speakers. Overall, I am quite impressed with these speakers and highly recommend them if you have the space for them. I have attended several hifi shows. I got home one day after one of those shows and remember playing a vinyl record and enjoying my system a lot more than most listening rooms on that show. BTW, they are powered up by 45 Watt SET mono blocks. A big thank you to Troels for all his hard work and amazing designs! The OBL-15 required a little different acoustic treatment than conventional speakers. Any broadband absorbers behind the speakers made the sound dull. Instead, place diffusers behind them and enjoy their full potential. On the wall behind the listener heavy duty broadband absorbers made miracles. That had better effect than the diffusers behind the speakers in my room. An interesting read - http://www.linkwitzlab.com/rooms.htm - section D1.